In bargaining today, we came willing to move on most of the non-economic issues still left unsettled, in the hope that we could reach agreements and move closer to finishing these negotiations. For a final deal to be reached, though, administration will need to move on merit and the NTT reappointment process. On these core issues, we have seen no meaningful movement on management’s side. Tomorrow, we will be back for another round of negotiations, and discussion of the money proposals still in play. If you haven’t been to a bargaining session, now is a great time to see the process at work. All members joining us will have the opportunity to participate in our caucuses between negotiating with the admin team. Tomorrow’s bargaining session will be from 1-4pm, at Student Center East, Ft. Dearborn Room. The session will be followed by a guest lecture from distinguished labor activist and organizer, Jane McAlevey, 4-6pm at the UIC Institute for Humanities, 701 S Morgan St.
Our strike hashtags are #UICFacultyStrike #FairContractNow #Solidarity. 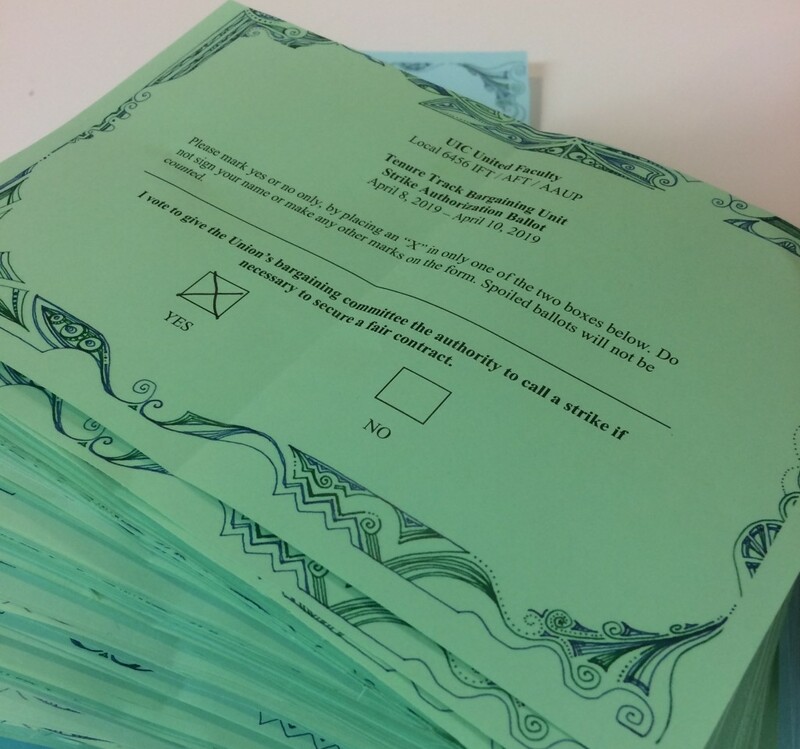 After 3 days of voting, nearly ¾ of UICUF members went to the polls, and the results are unambiguous. 93% voted to authorize a strike, sending our administration the message that they must offer us a fair contract, or face an indefinite work stoppage until they do. As UIC grows, we believe the administration should invest in our exceptional faculty to ensure that providing students with a high quality education remains the university’s top priority. Our negotiators have been very clear that our members need a compensation plan that goes further, so that they can focus on their students without worrying about losing ground as the cost of living rises in Chicago. We’re seeking a plan that makes up for stagnant salaries in the lean years of the budget crisis, gives meritorious faculty raises above cost of living, and offsets rising healthcare costs. Administration’s response yesterday is unfortunately a familiar chorus by now: There is no money for that. It is critical, now more than ever, for UICUF members to show the administration our resolve, and we have an immediate opportunity to do so. There will be another bargaining session, tomorrow, Friday, 4/12, from 12-3:30pm, at Student Center East, Third Floor, Dearborn Room B. Packing the bargaining room with members is the best way to show that faculty will not stand down from demanding a high quality working and learning environment at UIC. We also hope that filling the room with members to observe firsthand the administration’s attitude toward faculty will help to change the dynamics at the table we have seen so far. It’s important to be prepared in the event of a strike, and many of you will have questions, or have questions asked of you. We’ve put together a couple of FAQ’s for our members as we make ourselves strike ready. Further questions should be directed to UICUnitedFaculty@gmail.com or to your College Representative. As of April 11th, UICUF has filed an intent to strike. This does not guarantee a strike will occur, but allows our bargaining team to call for one no sooner than 10 calendar days after filing. If a strike becomes necessary to win a fair contract for faculty, UICUF wants to make sure you have as much information as possible. Below, we’ve tried to anticipate the most common questions, but if you can’t find the answers you’re looking for, please email UICUnitedFaculty@gmail.com. Who can go on strike? Anyone who is in the bargaining unit is authorized to go on strike, whether or not you participated in the strike vote. Striking is a right of every union represented employee regardless of whether you are a membership or not in the organization. However, access to certain financial assistance programs offered by IFT/AFT/AAUP are only available to members who have signed UICUF union cards. What does a strike look like for faculty? Faculty are asked to cancel all classes, office hours, and participation in committee work and other activities and to support the union by picketing for a few hours each day of the strike. There will be designated locations on campus which faculty and supporters can go for instructions and signs. We will also have a place to get coffee and snacks. Look for email with more details if we strike. For a successful strike we need to mobilize numerous volunteers to show our solidarity and strength. But what if I just want to stay home from work and not do any of those activities? There is no such thing as being partially on strike. Support of a strike means we do not report for work or perform work duties for the duration of the strike. But it also means that we get out and do as much as we can to make the action successful. We each must decide what that means given the nature and scope of our work at a public research university. Picketing is a lawful expression of our first amendment rights. It is our most visible expression of purpose and solidarity. We can picket at any public place, but we cannot completely block an entrance or exit, or cause a danger to health and safety. Before any picketing events, we will confer with IFT legal counsel, the Chicago Police Department, UIC Police, and the Illinois State Police to ensure that we are in compliance with their directives, local ordinances and state laws. All picketers will be given a list of proper conduct on a picket line. Before the first date of our strike, members will receive an email informing them of our central meeting location for picketing. They will then be given signs and directed to walk back and forth in front of doors to buildings where classes are commonly taught. Members should not yell at those who decide to cross the line; but our picket lines ARE the message that anyone in the bargaining unit who enters the classroom is undermining our solidarity. Will my pay be docked for going on strike? What about Insurance? The university has the legal right to withhold pay during a strike but the issue must be bargained with the union. We believe that there should be no disruptions to health insurance since, assuming a strike later in April, we will be “pre-paying” for our monthly insurance on April 15 when we receive our paychecks. During other recent strikes at University of Illinois, including our strike in 2014, the employer still provided health insurance. Also, zero interest loans are available through the IFT/AFT and UICUF has a strike fund for members in need. Will the university know who participated in the strike? You are under no obligation to inform management in advance as to whether you will be taking part in a strike or other action. No one individual can be isolated for his or her involvement— a majority of the membership will be taking collective action and standing in solidarity together. Recording or threatening to record the names of employees who engage in protected activity is against the law. If you are asked by your department head or chair about striking: Don’t answer. Their request about whether or not you will be working – even if phrased innocuously – can be perceived as chilling your rights under the IELRB. You should show them a copy of the strike notice UICUF filed and tell them it is illegal for them to ask faculty about participation. If they persist, immediately inform a union representative or email us. Can I be fired or disciplined for striking? No. Your right to strike is protected under Illinois law- whether you have signed a union card or not. Dismissal, termination, non-renewal, or other forms of discrimination to break a strike will be vigorously opposed. IFT/AFT/AAUP legal funds are earmarked to protect these rights. Many workers in the University of Illinois system have been on strike, and none were disciplined or fired. Any bargaining unit members who believe they are being singled out for disciplinary action as the result of participation in this strike should contact their union representative immediately. What about Students, Graduate Employees, Adjuncts, Civil Service Employees and others on campus? During the strike, individuals may be crossing the line specifically because they are not in our bargaining unit. This includes some lecturers and adjuncts whose appointments make them ineligible for membership, and do not have the protections of their own union contract. Many, including TAs, have clauses in their union contracts that prevent them from striking in sympathy with other unions. Some people will have the ability to work elsewhere or to take a vacation or personal day, but others have no choice but to work on the days of our strike. We will not try to persuade them not to cross, though we will provide them flyers that inform them of what we are doing and why, and we will invite them to picket with us once they are out of class or off work. Adjuncts, part-time lecturers, and other faculty who are not a part of any union bargaining unit can contact us with questions as needed at UICUnitedFaculty@gmail.com. Can the university use graduate students to teach my classes while I’m on strike? Graduate assistants and teaching assistants are protected from teaching load increases through their Graduate Employee Organization (GEO) union contract, and therefore should not be asked to take on work otherwise normally done by faculty. As stated above, they cannot withhold their own labor, so sections, labs, grading or other responsibilities they have in relation to your class may continue. We encourage grad workers to reschedule or relocate classes in accordance with their academic unit’s policies where possible to avoid crossing picket lines. My unit requires me to document which days I do and do not work. How do I deal with this? You should not provide any information about whether or not you worked on the days UICUF was on strike. It is an unfair labor practice for administrators to document who does and does not participate in a strike. If someone challenges you on this, you should show them a copy of the strike notice UICUF filed and tell them that they cannot ask faculty about participation. If they persist, you should immediately inform a union representative or email us. How do I communicate with my students about the strike? We are a union of professionals and we know that our members don’t like taking any action that affects students. However, when we take action, we are making a case for the quality of the service we provide. We believe that our students will be hurt far more by management’s actions than our own. Observing the strike is defending the interests of staff and students alike. Undermining the strike will only serve to encourage management and we will all suffer more in the longer term. Formally, it is management’s responsibility to explain to students if classes are to be cancelled on strike days. However, you may wish to talk to your students before the strike explaining why the union is taking this action, and we have provided a one-page leaflet for this purpose. Faculty may wish to specifically indicate to students that while grad workers will continue with their sections/labs, lectures may not occur, that faculty may not be available, and that grades will be established on the basis of whatever assignments were completed, in accordance with department policies. For more ways to discuss the strike with students, see our Student FAQ. I have federal grants that require me to continue working. What should I do? You may continue working on grant-funded research that mandates you continue working—our strike is of labor contributed directly to the university, with whose administrators we are negotiating. But classes, committee meetings and other university functions are included in the strike. If a strike happens, what about my access to university equipment? Remove anything you’ll need from your office before the proposed strike date. Please do not pop-in to your office or lab during the strike – even for a minute. What about answering work emails? For the purposes of a strike, answering your work email is work. We advise faculty to put up an away message notifying people that you are on strike for a fair contract, and will return any communications after the strike ends. Communications from the union will not go to work emails at all regarding the strike. Email UICUnitedFaculty@gmail.com if you need to notify the union of a non-work email you wish to receive strike updates on. How does my immigration status affect my right to strike? Individuals who are H-1B visa holders and permanent residency visa holders (Green Card) have the right to strike as a lawful activity. F-1 visa holders have the right to strike or not strike unless the US Department of Labor certifies the strike, at which time F-1 holders must not report for work (in essence F-1 visa holders cannot be used as a strike breakers.) There are no specific rules about strikes for J-1 visa holders. The safest advice for J-1 visa holders is to stay within the wording of the Exchange Visitor Program in which they are enrolled. It is clear that J-1 visa holders cannot be used as substitutes or replacements for other employees who are on strike. Questions or issues about visa matters should be directed to the designated strike committee contact person. Email questions to uicunitedfaculty@gmail.com. For immediate concerns, call or text Jeff Edwards at 773-895-6499. 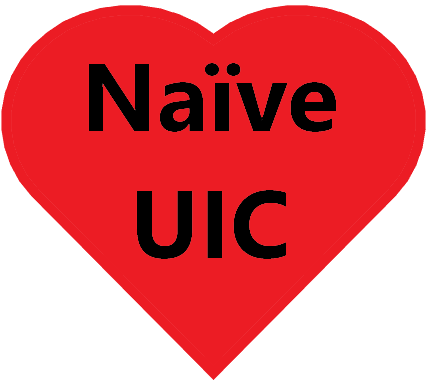 In the first negotiating session between UICUF and Administration in 2019, the Admin team returned to the table with some concessions, recognizing that faculty can and will stand firm on our principles. Despite these moves, many issues remain unaddressed or dismissed outright. Proposals to enhance shared governance in certain areas, which is of particular importance to the union, still seems contentious for Admin negotiators. Meanwhile, UICUF presented counter proposals as well, revising some of our own language to create space for dialogue. We began this process with high expectations, especially in light of all the positive developments for the University. In contrast to the backdrop of previous negotiations, UIC is currently expanding. Plans to dramatically increase enrollment are being matched with a billion-dollar plan to build new facilities. Amidst this rapid growth, it seemed like a no-brainer that the faculty would share in the prosperity, with raises to catch up from the lean austerity years, and to support a growing student body. Our proposals at the bargaining table reflected this optimism. Unfortunately, our proposals to make faculty wages competitive were not met with the same enthusiasm Administration seems to have for new buildings. Given the contemporary example of Wright State, which has pushed faculty to tighten belts while their board prioritizes other projects, we’re very wary of any similar dynamic developing at UIC. At this time, after more than six months of negotiations, we remain far from what our negotiation team considers a fair contract. With our priorities clearly on the table, and the board’s only Chicago meeting of the semester coming up on Thursday, January 31st, we are encouraging members to join us from 9:30-11:30 at Student Center WEST to demonstrate our commitment to winning a fair contract. Email UICUFJeff@gmail.com to RSVP to this event. If you want to catch up with what’s been happening with the union over the last semester, you’re in luck! Our Winter newsletter is now published and available, covering topics including the Janus decision, contract bargaining (and campaigning), our new Committee on Political Education, and our everyday union victories. There are also plenty of actions and events coming that you’ll want to check out, as well as a number of scholarship opportunities for union members and their families. 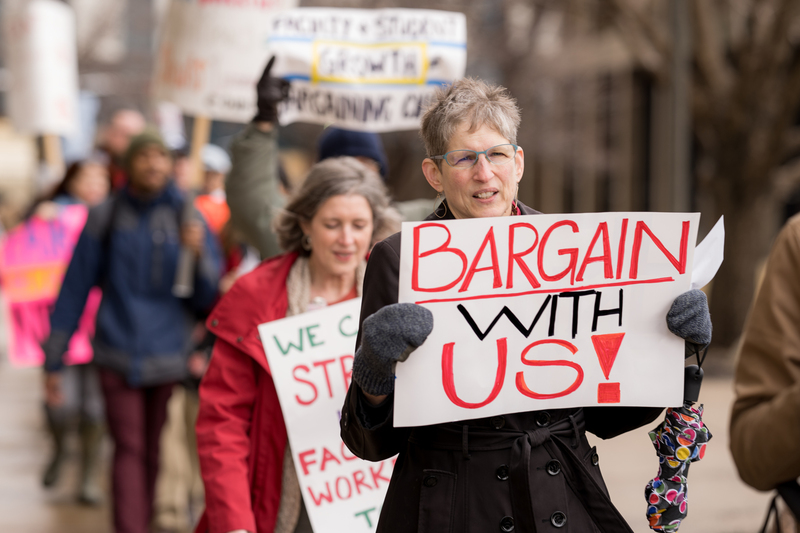 UICUF and U of I Administration have been negotiating over the faculty union contract since June of last year, and our previous contract expired in August. In the final session between the two parties before winter break, discussion became heated as faculty attendees expressed frustration with Administration’s dismissive stance toward faculty proposals, hampering the pace of the proceedings. Cautious hope for fair treatment at the bargaining table notwithstanding, it is becoming clear that we will need to take action beyond those negotiations to win a contract we can all be proud of. An Organizing Committee was convened yesterday to plan a campaign of escalating pressure on Administration. That campaign is intended to continue until faculty get a fair contract, and may incorporate workplace actions, including calling for a limited or indefinite strike before the end of the semester. The consideration for a strike is not taken lightly, but is seen as an increasingly likely outcome, if Administration continues to disregard faculty concerns and proposals in the negotiating process. 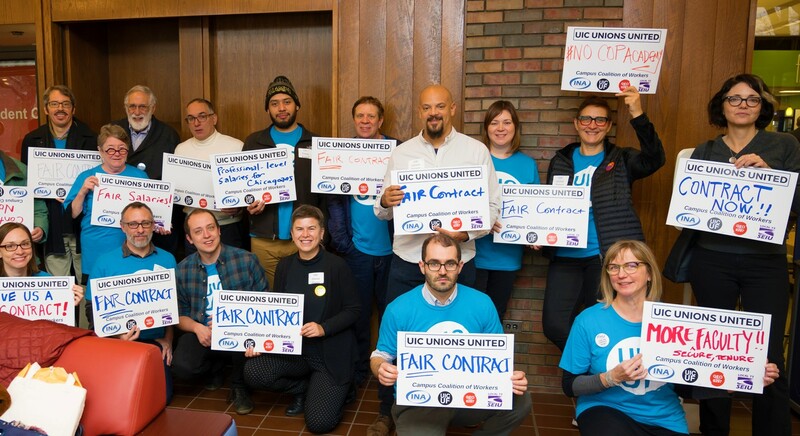 In light of the growing need for direct action to secure a fair contract that respects faculty and enriches the UIC community, UICUF leadership is calling on all members to watch for ongoing union communications, and get involved in any way you are able. At this time, participation in our Organizing Committee, or as a Contract Action Team member are of paramount importance. To get involved, please email UICUFJeff@gmail.com. With your support, we can make UIC an even better place to work and learn! Until we win a fair contract, we will be issuing regular updates via email, Facebook, Twitter, YouTube, and here on our website. We strongly encourage everyone to like and follow us on social media. 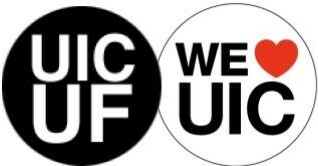 If you want to contribute your story, pictures, video, or other content related to the activities of the union, email us at UICUnitedFaculty@gmail.com. With your support, we can make UIC an even better place to work and learn!